This picture above is my latest portrait of my husband Ross on his 1979 CB650Z Honda. I decided to do it in pen for a change and really love the effect. I can do commissions of yours too if you like. My latest commission is an acrylic painting of a cute dog sniffing a rose. 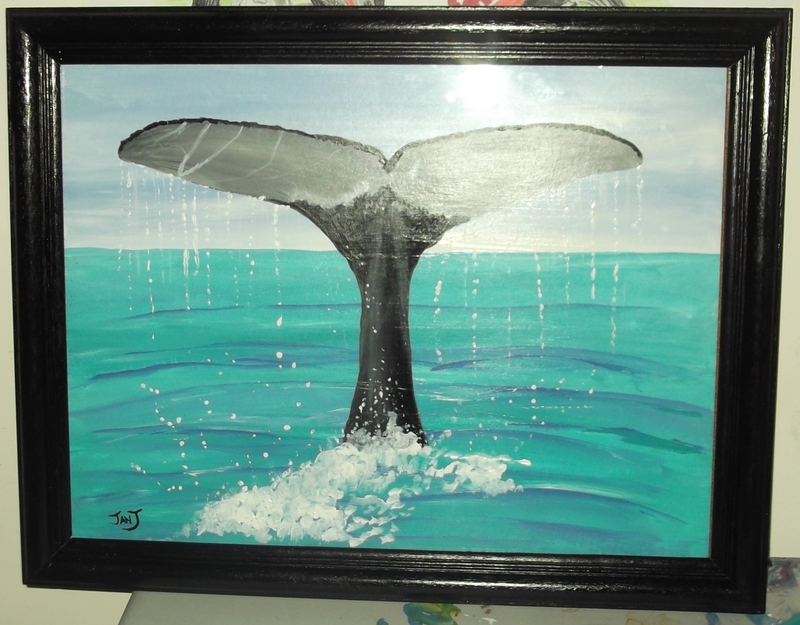 I really enjoyed painting this, so I went and bought 3 more canvases as I haven't had the paints out for a while. I ran a competition a couple of weeks ago, and a lady won it from the Central Coast and this is a picture of her beautiful boy. A4 Graphite. 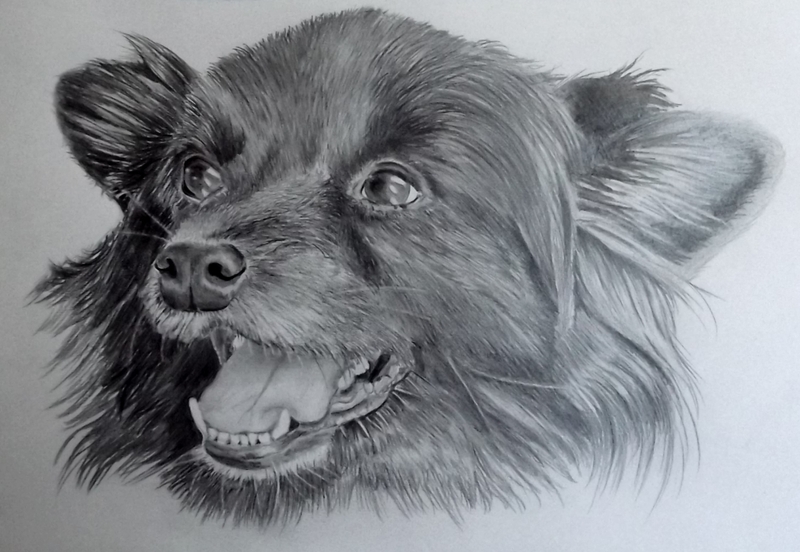 My eldest daughter bought a rescued dog recently and of course, I had to draw her, so this is Hazel. I am a member of a group on Fb which deals with animals and I saw a beautiful photo of a ladies 3 dogs and a cat. I asked her if I could draw them and give her a print when finished. She was more than happy to, so here is the A3 portrait and hopefully the lady will get her copy on Monday. Can't wait for her to let me know what she thinks of it. 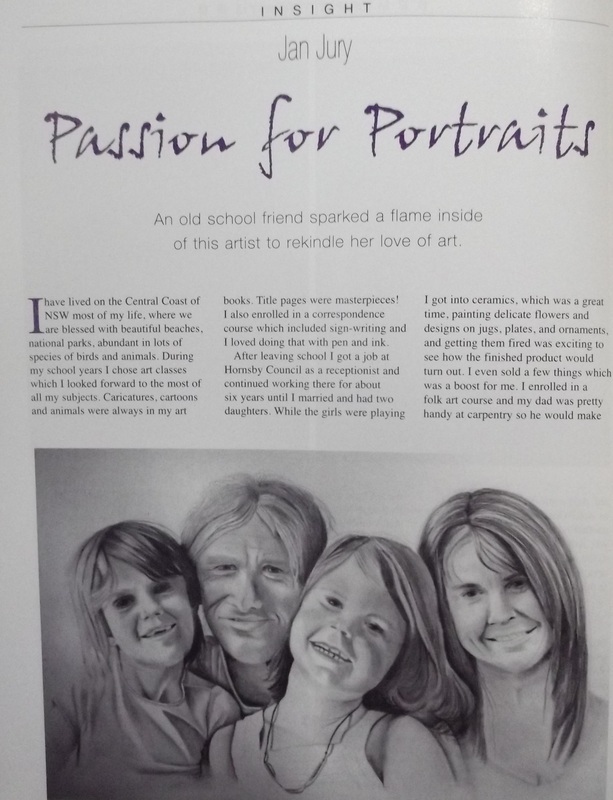 Well thats about all the gossip and art I have done lately, so if you are interested in getting a portrait or painting done, also there are ready to go paintings in the other albums, send me a message by clicking the Contact Tag up on the left of page. Try and fit some time into your daily routine to chill and enjoy whatever your passion is, its good for your soul. the year has been flying as usual. I have cut down my market attending, it got too hard with the travelling so decided to do some local, once a year markets that attract lots of people. The gnostic mana cafe at woy woy have 26 of my paintings hanging up for all of april, so i have been busy getting that ready. here are 3 of my new ones i did for the cafe. 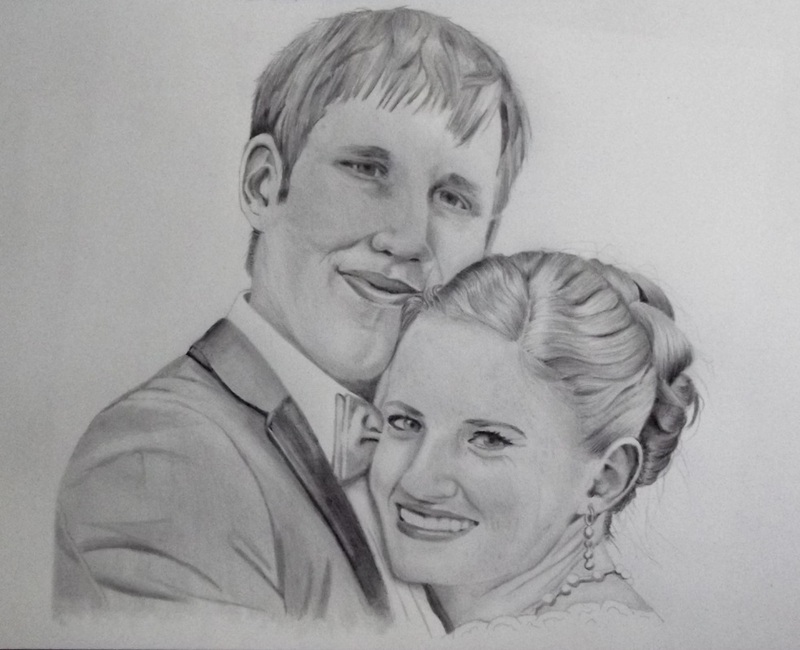 I still love drawing portraits and have done quite a few this year, lots of local clients which is always good. I have a competition going at the moment which ends tonight. you have to write a caption about a photo I posted and ross will pick the one he likes best. here are 3 of my latest portraits, they are all a4. 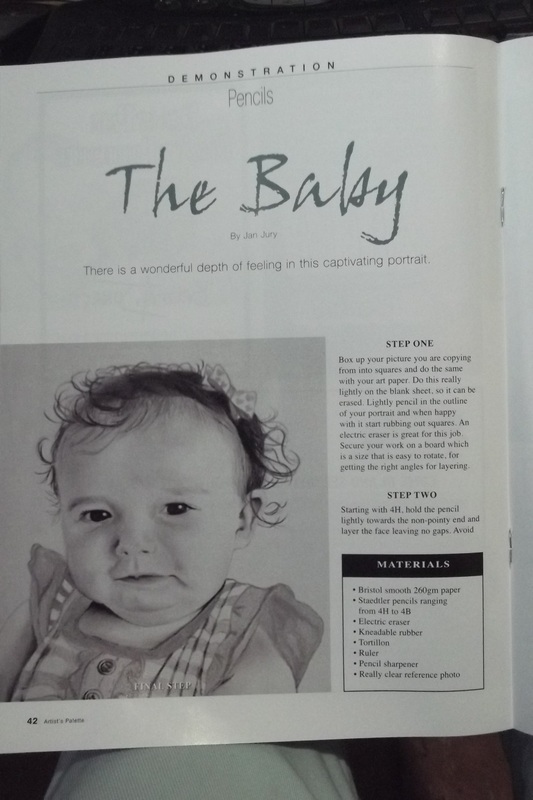 The biggest question people ask when ordering portraits is the photo they send. It must be from a digital camera and the pixels around 3000. The reason I ask this is because I have to enlarge it to see all the details in the face of my subject. I don't like knocking people back because of poor quality photos, but sometimes I do have to. 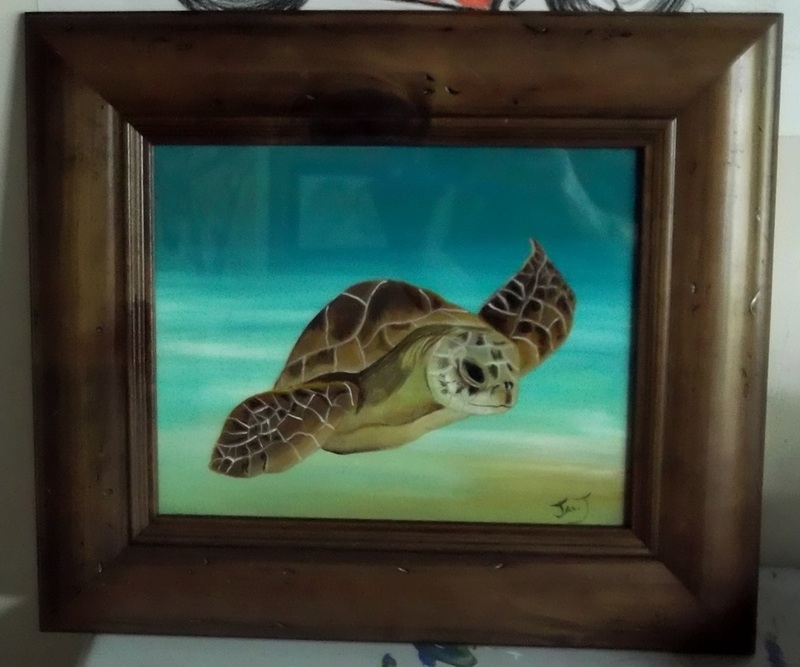 So if you are looking for a unique gift for a loved one, whether its an animal, car, or person, send me a message with the photo and I will get back to you asap. Prices start at $100 A4 for 1 subject. 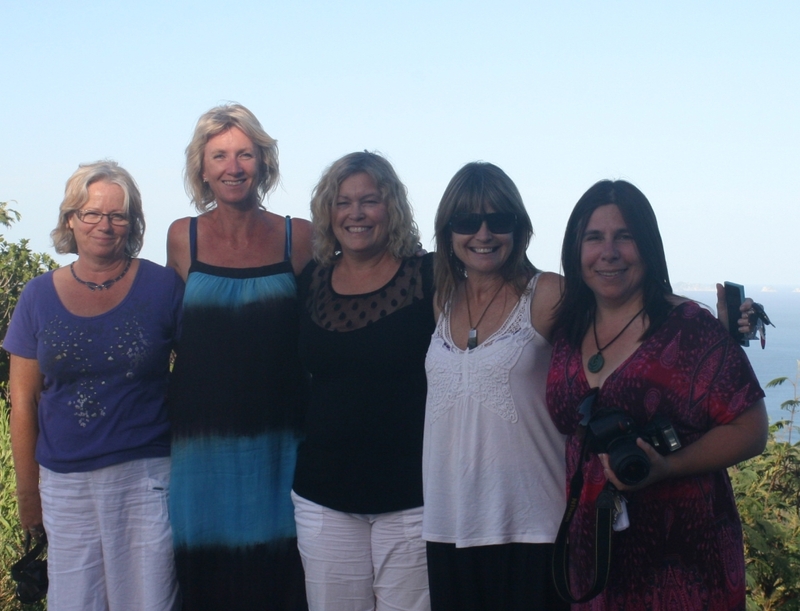 Totally missed February, it flew by, with me doing massages, markets, and a visit to New Zealand doing the art retreat. So i will start with the last bit about the art retreat. The flight over seemed to go in a flash and I was met at Auckland by Chris. Stayed at her place for the night and we made our way down early the next morning to Reina's place at Tairua. Lovely sleepy little town, very close to the beach, shops etc. Meeting Reina was such a pleasure, as was her partner and daughters. The other ladies rocked in around mid morning, so we spent some time getting to know each other. Straight into the painting then. Nothing was scheduled which we were all happy with, if you felt like painting, walking, sleeping, eating then you could do it. Dinner was probably the only thing we set a time to. 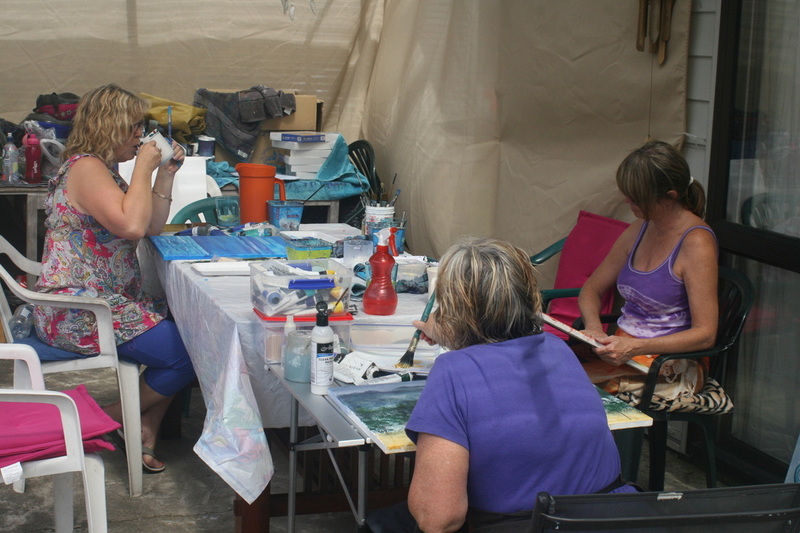 A fair bit of painting went on and it was great seeing other artists in action. We ventured out and about to nearby beaches, winery and shopping centres. I am glad I went on this little adventure, lots of fun memories, made great friends and it was something that was out of my comfort zone. so its been busy getting things ready each week for them. There is a Classic Aussie Rock Show on this weekend, so hoping it will be a busy day! 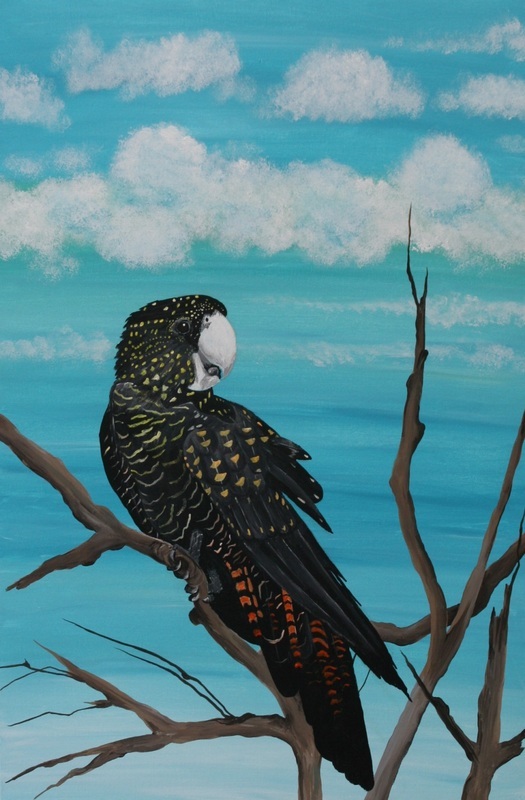 I sold my last black cockatoo painting and the 3 piece bird painting last week so happy about that!! So I did another black cockatoo painting and its ready to take tomorrow. 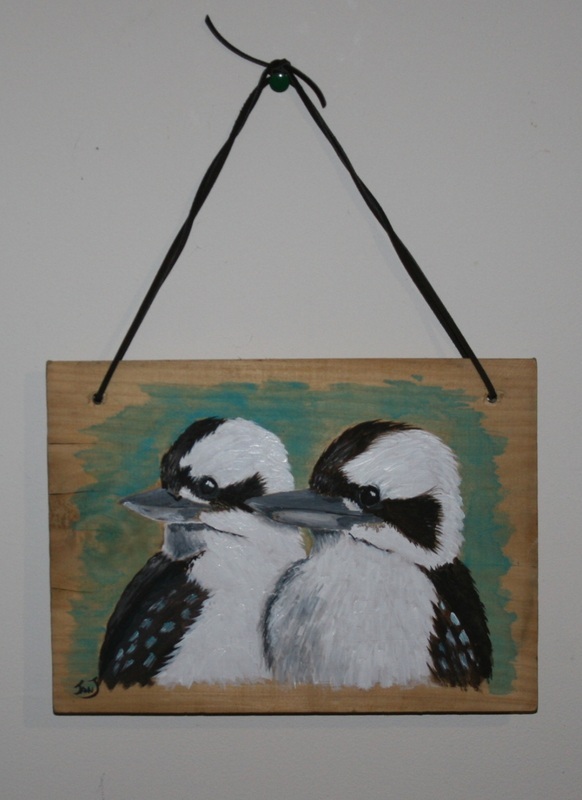 I also picked up some wooden boards to do little paintings on. 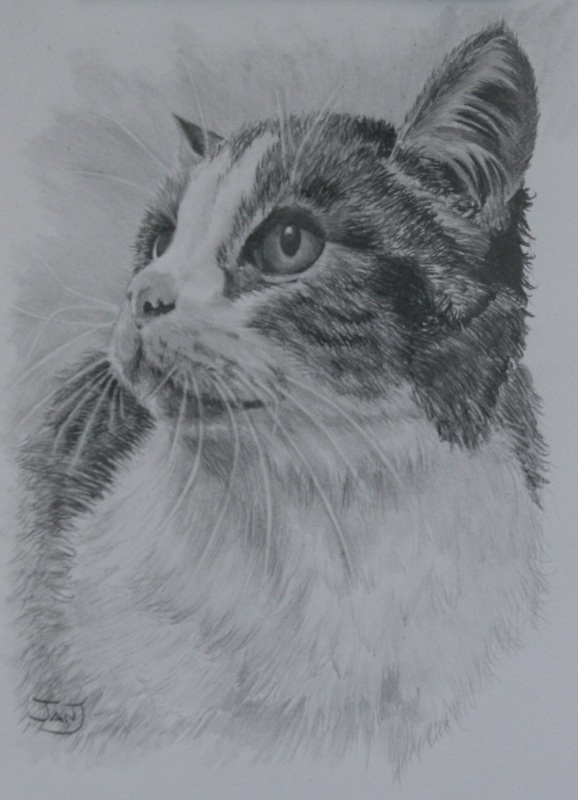 I also had a commission from Alison to draw her cat. 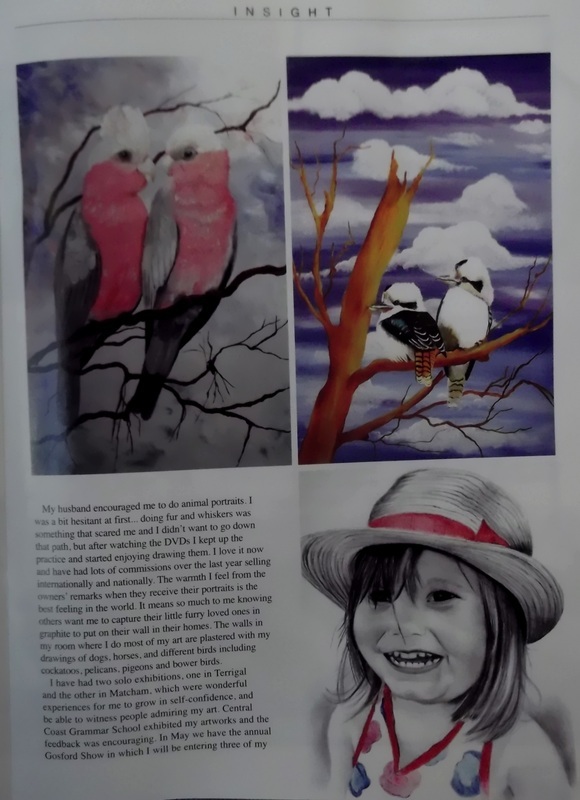 'Thursday Louise' and did a winning portrait for Jane, a portrait of her pink galah. Both I enjoyed drawing a lot!! Hubby Ross is on leave now so I have got him doing lots of things around the place, he said he needs to go back to work for a break!! Hehehe I know he really loves it all. He made these great picture stands for me from recycled timber. Can't wait to set them all up at the markets along with my new banner and floor mats. New pics will be up on my art page Saturday night or Sunday morning. Our stall is going to look amazeballs!!!!! Still have my 3 year old grandson over during the week and I asked if he wanted to paint on my garden rocks, he said no thanks nan. I asked him later why not and his reply was 'nan sometimes I feel like painting, sometimes I don't'. Don't we all feel like that at times? I do hope you are all well and enjoying life. Always take time out to do what you enjoy whether its rock climbing, dirt bike racing, gardening, dancing, meditation or even reading. Eat healthy, cause its the only body you will ever have! Love and Light to every one of you. So! Another year has started and January is well into its month! 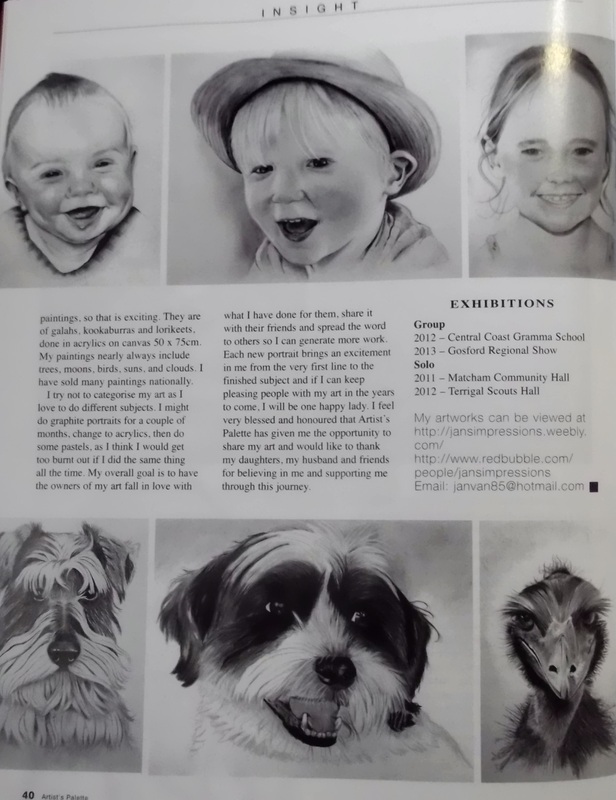 I have worked on two portraits, one an A4 dog portrait for Emma and an A3 two people portrait for Merryn. Both turned out really well I think, and both owners were happy too. I will put up a pic after. I have an Auction going at the moment, it runs out tomorrow night at 6.pm. It is a cute little jewellery case/cd holder made from mahogany and is velvet lined with my artwork on the top. My two wolves. The bidding is at $40 at the moment so if you would like to see it and reckon you would love it as a gift or keep yourself, head to my facebook page Jan's Impressions. It is pinned to the top for easy access. Place your bid and I will notify the winner tomorrow night. From reading the last paragraph I drew two wolves which I love, so will post a pic up soon too. I will be starting markets at De Bortoli Wines in the Hunter Valley on the 1st February. We bought a lime green marquee, so we will stand out thats for sure! So if you are interested in having a look here is the link to check out... Hunter Wine County Markets Looking forward to doing them. It was my youngest daughters birthday last week, so we had the family over for dinner, nice catching up with them, had a few wines, laughs, head ache the next morning, off the grog for a while.... well till next weekend when its my birthday hehe. My grandson stayed a couple of days which is always a fun time. We were trudging around outside looking for treasure following the arrows, fighting our way through the jungle, scaling mountains and crossing treacherous rivers!!! Being 3 (Hunter that is) his imagination is wonderful. We play this game over and over and it always amuses me how excited he is when he finds the X with the treasure!! Its only 1 month away now till I am flying off to New Zealand, Tairua. Its the North Island about 2 hours south of Auckland. I am going to an Art/Creative Retreat for 4 days. There is about 6 of us attending, so I am looking forward to getting away for a small break and meeting like minded ladies, having paint time, and site seeing. 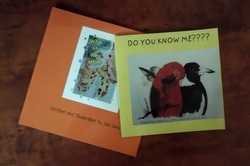 I have also put together a couple of kids books, mainly for my grandies, and nieces kids. Its all my artwork and writing and had such a fun time putting them all together. If anyone is interested in having a look I can give you the links to see them. Well thats about all the news that has happened for this new year!! Lots more drawings and paintings to come I am sure of that. If anyone would like something done for them, please contact me and I will do my best to help!! Any new year resolutions being made, good luck with them, I don't make any just so I don't disappoint myself! How have you all managed your families get togethers? One day with some, another day with others, some you don't even see? Gets a bit hectic doesn't it? I ate way too much and put on 2 kilos, deserts two days in a row, which I never usually eat!! Totally enjoyed them though. Back on track now. We have 5 littlies under 3 in our families now, with another on the way, so it was fun watching them play, argue, sleep, play, argue, sleep hehe. Hunter managed to twist my arm into having a rest over last night.... not a sleep over as he reckons he doesn't need sleep. (3 years old) Mind you, he was in bed at 6.30pm and slept till 6am. 'morning nan & pop, I had a big rest'. I have done several new portraits this month. 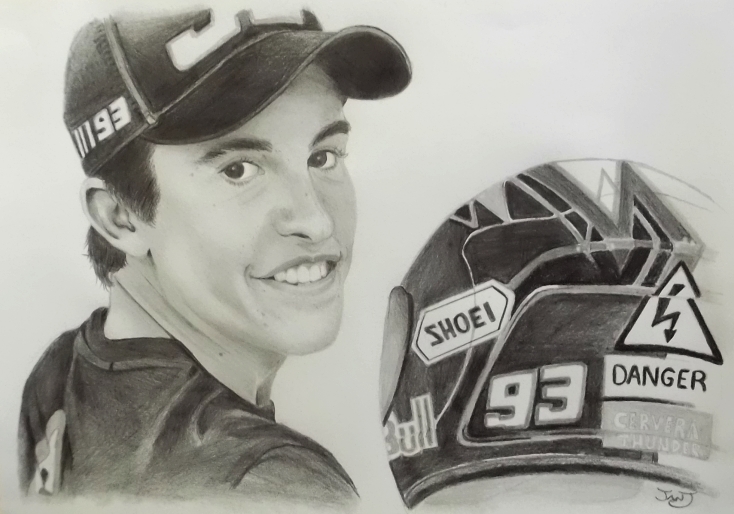 I drew Ross's Triumph, plus some hot rods, John Farnham, Chuck Norris & Marc Marquez. I will put up pics after writing this. This months contest I tried to be really tough, but my entries got it easy hey!! 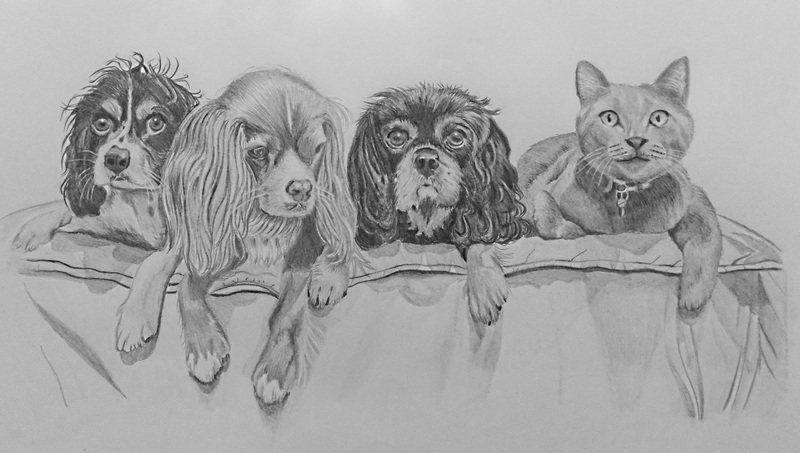 I had eyes of dogs I had drawn on the top row and mixed up the matching dog pics underneath. Anyways, I decided to have two winners, Monique & Diana won. Monique won a portrait and Diana won a set of my gift cards. Monica who owns Northlakes deli in S.Australia bought a bunch of my cards for the deli. pretty happy about that. Also sold a bundle of cards to Rosemary in Perth, many thanks. These are some of my portraits I did over December. 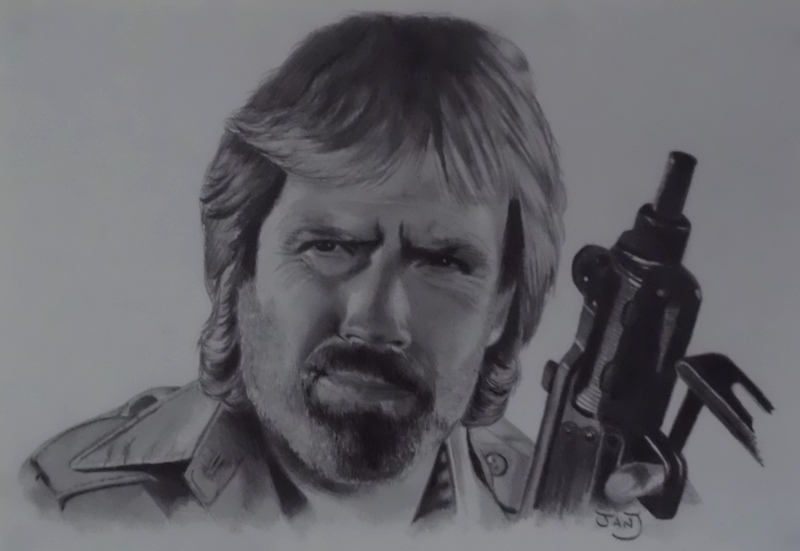 This is a little coloured pencil drawing I did too. 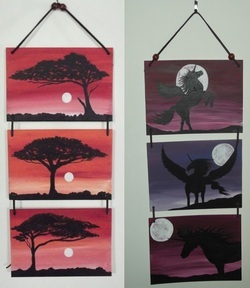 These are acrylic paintings on thin board with leather weaving between them. Only 5 more days before the start of a new year, can't believe how fast this one has gone! I am looking forward to it with my eldest daughter having her 3rd child in June and my youngest daughter moving into a town house in Carrington, Newcastle, with her partner. Totally two different things happening but good times ahead. I hope to put out lots of new portraits and paintings, and meet new people. Meeting new people means I am going to Auckland, New Zealand in February to an Art & Healing Retreat for 4 days, so really excited about that too. I have been to the South Island but not the North, and if its anything like the South it will be spectacular. So I hope you have all enjoyed your Christmas with loved ones, had lots of laughs, shared thoughts about loved ones that are no longer with you and for me this was Whiskey. First Christmas in 15 years he was not with me, still tear up thinking about him at times. Its just been over 2 months since he passed, I miss him. Whatever plans or no plans you have for the coming year, take care of yourself, be the best you can, life is short, so do what makes you happy as long as you are not hurting anybody. We all really just want to lead a happy, healthy, loving life while we are here. Be positive, true to yourself, we all have different views on things and thats a good thing. Get rid of any negativity that may be holding you back. Holey moley the year has flown! Just around 5 weeks till the bearded man drops into your chimney.... no not talking about my hubby Ross hehe. But if he did he would have some explaining to do! Its a bit different at our place this year, as we won't be having an actual chrissy on the 25th. It will be the weekend before and Boxing Day, but all good anyway, still get to eat all the yummy food and hang with rels. I made some little rudolph bags to put the kids pressies in and a feather christmas tree. Had a very crafty day and enjoyed it a lot. I did some markets last weekend and had a great day! Sold several paintings, cards, and a laminated Clint Eastwood. Met lots of lovely people and gave heaps of my cards out to those interested. They had a chocolate wheel there also and I ran amuk on it winning heaps of goodies including a six pack of crown lager beer, a cute doll with lots of accessories, $50 seafood voucher, and a large box of fruit and veg! The good thing was that it only cost $4. Thats a big plus in my favour!! 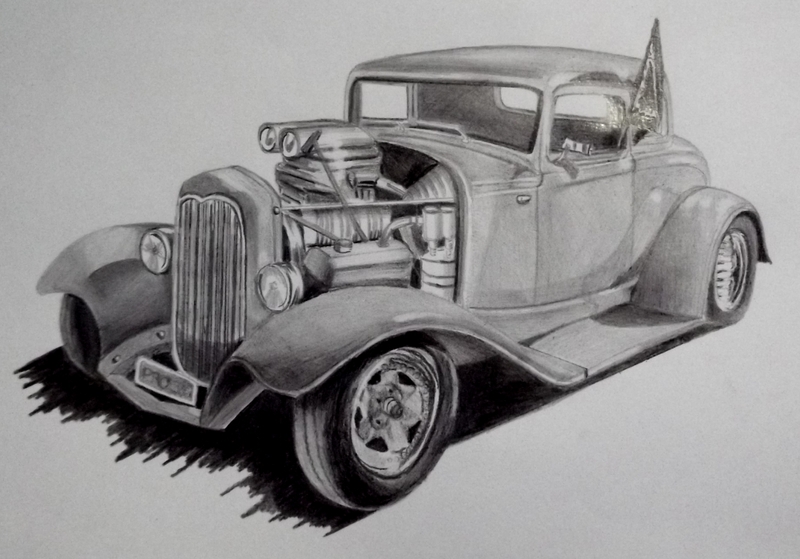 This months portrait give away was won by Randel, a great guy in Queensland. I put up a small section, being lips, of one of my movie star portraits and my likers had to guess who they belonged to. It was Arnies lips. I think it was too easy, reckon it would have been easier still if I had put up Mick Jaggers! So next month I will think of something harder!!! Arn't I mean?? 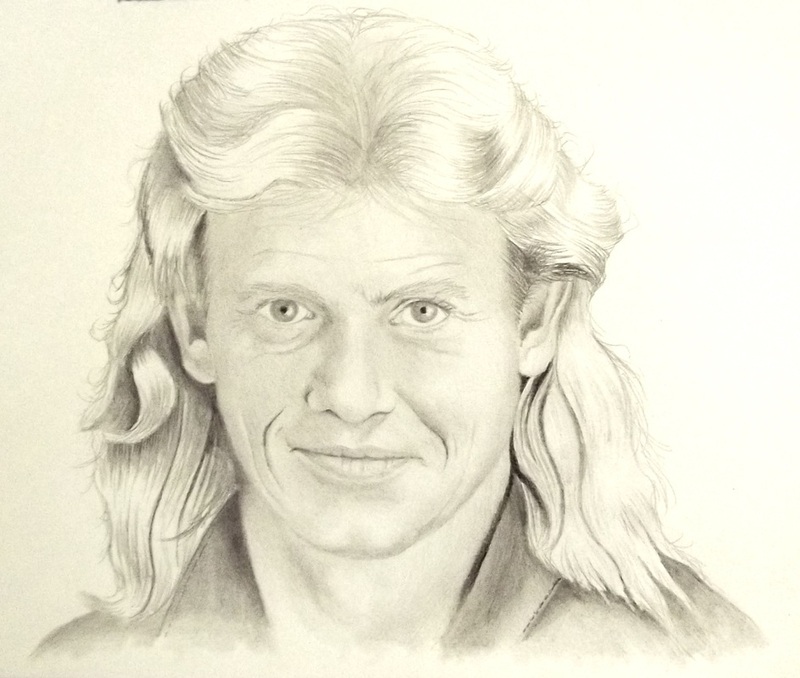 This is the portrait Randel asked me to draw. It was such a great photo to copy from, he should get it in the mail early next week. My next markets are on the 30th November. We have to pretty our tables up with chrissy decos, I really havent much room for that, but I will see what I can do, ho ho ho. So if you are around and looking for somewhere to go to kill some time, come and see me and say hello. Yes the jolly old man will be there too!! Hmmm does that mean lots of little midgets running loose?? I love it when they come to my stall and look,and touch, my mini canvases with easels....... its like a domino effect.... one falls, then the next, get the picture? grrrrrr and the mums go 'oh look what you have done now Jonny' and walk away. I am smiling but on the inside....... Ha!! I stopped the little vegemites by blu tacking the canvases to the easels and the easels to the table covers!! Did I mention Rescue Remedy works wonders for stress? I am really happy with it, but bike owners don't look too closely cause I skipped bits and pieces, mainly because I really didn't know what I was drawing and it was too fiddly weird looking. 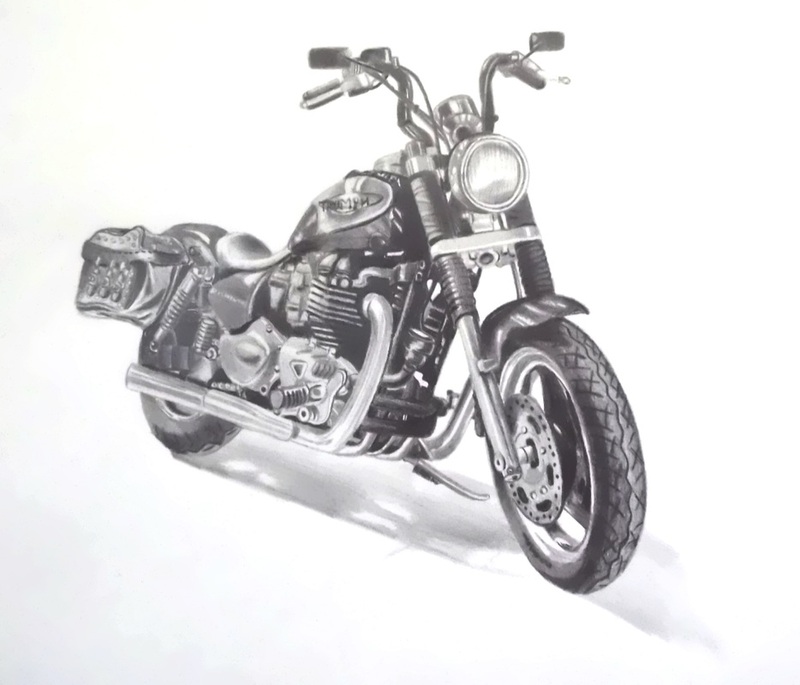 Saying that, if you would like me to draw your bike I will attempt to put in all details, I promise!! I haven't been out to the Gnostic Forest this week to see if any of my paintings have been sold, so I think Sunday looks like a good day to do that and go and have a cuppa and banana bread there. Would be nice to see some red dots on some of them. Our walls in the house are a bit bare without the paintings up. They are up in the cafe for another week now. Stay calm when shopping, its a jungle out there from now on. Car park rage is on the increase, so just smile at the angry people. Thats whats been happening with me for this month, hope you are all having a peaceful time and your lives are enriched with an abundance of whatever it is you need in your lives at this time. Stay safe and love the ones you are with. Terrible time of year here in NSW Australia. Bushfires are everywhere and many people have had to evacuate their homes and many unfortunate ones have lost theirs. We pray for downpours of rain to put them out totally. Our Firemen and women are working continuously around the clock. I have had my ups and downs this month, selling some christmas cards on Redbubble, a big thankyou to the buyers!! The markets were a disaster with the wind howling through the stalls and made it very unpleasant, so we made the choice to pack up and save my art from being wrecked. I put up 10 drawings of animal and bird eyes and people had to guess the names, Next month will be another free portrait up for grabs but I will do it different this time again. 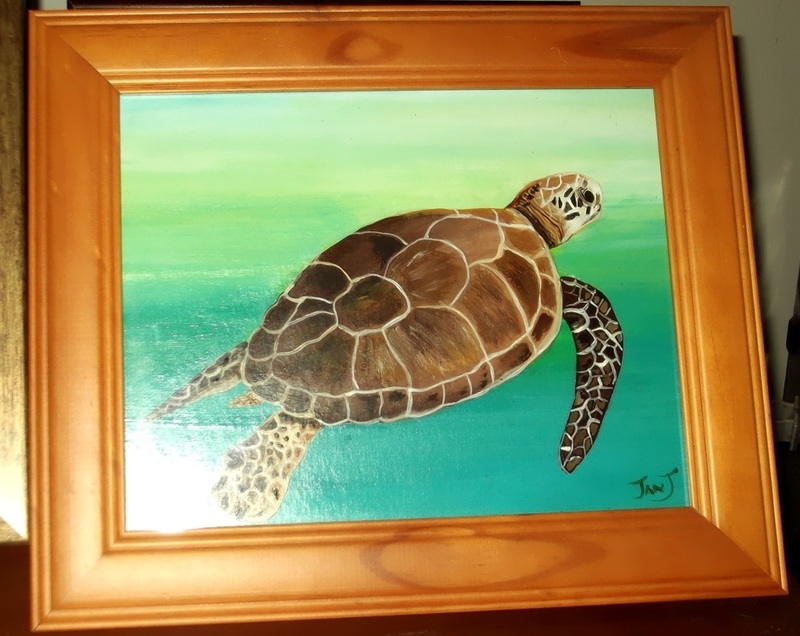 I am setting up on Saturday my art for the Shelly Beach Markets. These are indoor so no trouble with the wind this time. So if you are out and about come and have a wander through. There is over 100 stalls and I am in the Yellow Zone Stall 71. I would love to meet you if we haven't already met and if we have, love to chat with you. Here is a brochure so you won't forget! So....... the next big exhibition I am having is all of November at the Gnostic Mana Cafe. I will be having up to 15 of my artworks there and very excited about that. The Gnostic Forest is in the centre of Woy Woy. I think I will put in a mix of canvases, acrylics on board in frames and graphite. Its been quiet on the homefront with my grandkids, they have been away on a holiday to Queensland for 2 weeks and I miss their little faces and hugs. They are heading home in a couple of days so I am looking forward to having them here. Take care where ever you are, hug your animals and treat them as you would like to be treated yourself. Spring has hit with avengeance, already had temperatures up in the 30's. Lots of smoke around with burning off and fires. 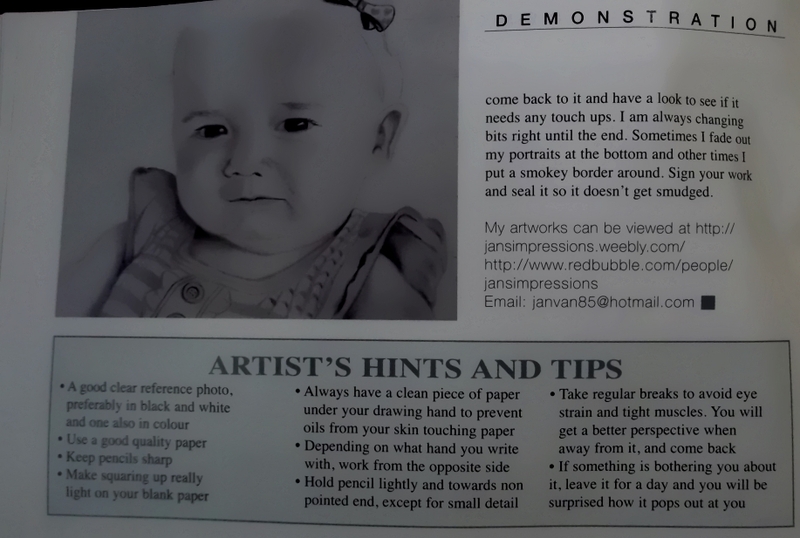 The first good news was my write up in the magazine Artists Palette. Pretty stoked seeing my art and story in there. I shared it on 5PM site and they were all pretty impressed. Pictures are down a bit further. My last markets was a good one. Met lots of great people, and sold a few paintings and cards! One lady even took my photo of me holding up a painting she bought, which was pretty embarrasing!!. She was sending it overseas and wanted to show them the artist. 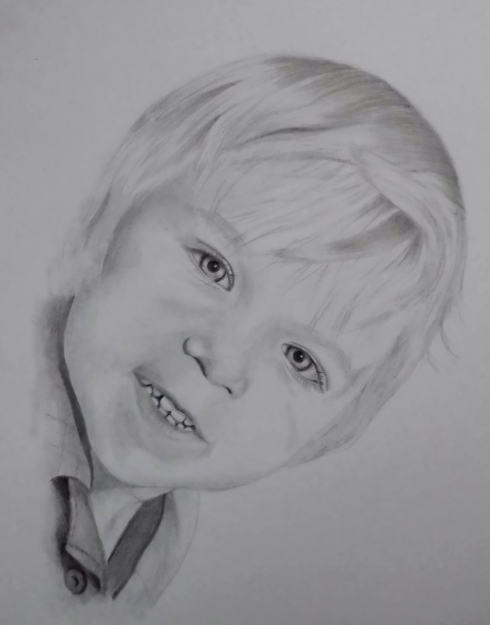 Lots of people interested in getting portraits done, so hopefully they will get back to me. I was pretty buggered afterwards as I had my two grandkids staying the night, but all good, had a nana nap in the arvo when they went home. The next big thing was the Central Coast Grammar School fair and Art Exhibition. Had cheese and bickies on the Friday night and checked out the artworks, around 300 exhibits. 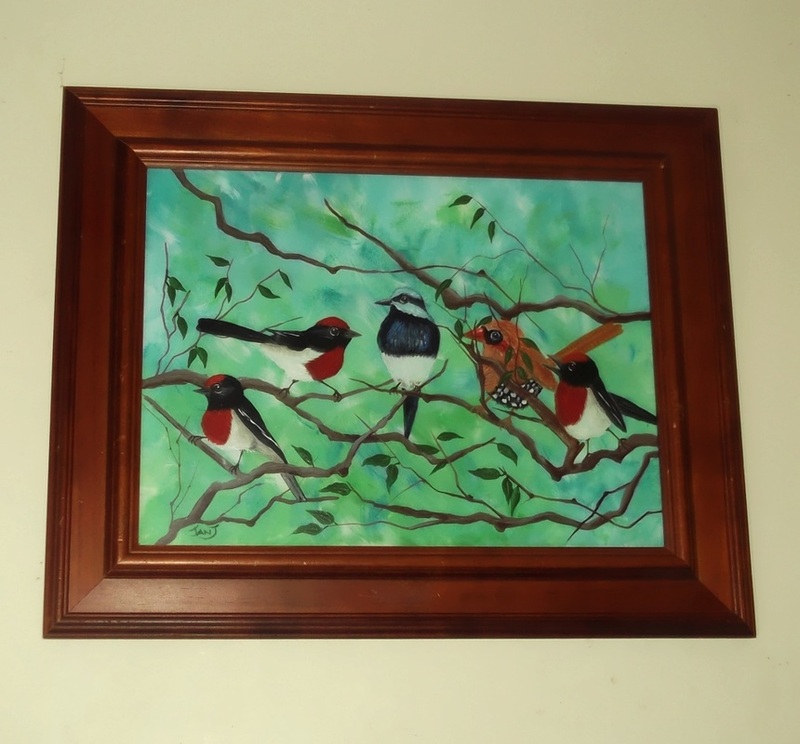 I was happy with my display of the birds as the background was black and they were all together. I popped over on the Saturday arvo and got such a shock when I saw a red dot (sold) on my black cockatoos!!!! I was so excited and because I was by myself, inside of me was doing a happy dance and shouting with joy!! Ross was at work so I quickly text my girls. Such a great feeling! 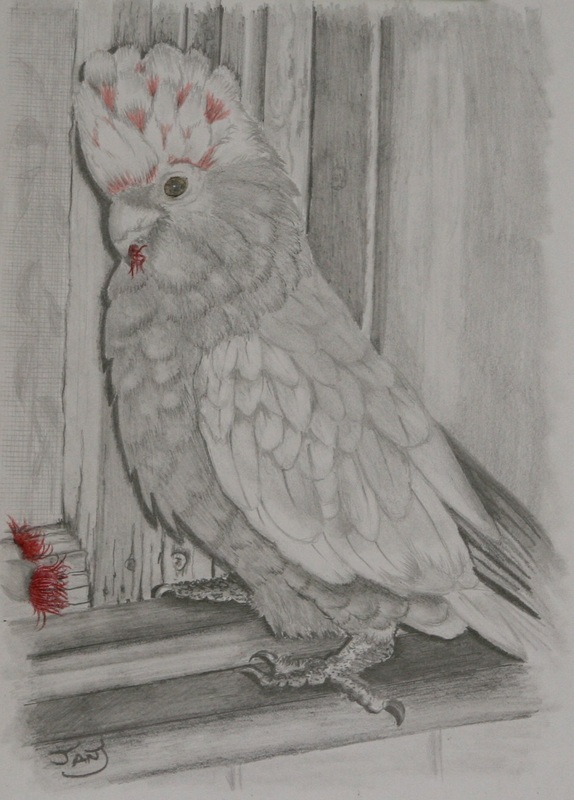 Since I sold my cockatoos, I decided to paint another one to have in my collection, so here it is. My next market day is on Saturday 28th September, looking forward to that. Ross has made me some very cool timber and calico holders for my smaller paintings to sit on the table. Also scored a wire turning card holder which I can hang some of my portraits as well as cards on. So! If you are on the Central Coast that day and want to do the markets thing, with over 100 stalls come and have a walk around. I am on Stall 69 Yellow Zone, come and say hi, love to meet you!! Will be a busy day too as we have the grandkids for that night also. Lexi had her 1st birthday last week and Hunter will be 3 next month. The midgets are growing fast!!! Love them to bits. I hope you are all having a great September month and enjoying your activities whatever they may be. Take time out just for you, stay healthy, eat well, do a little exercise, and smile at passers by!! Love and Light to everyone of you. This month has shot ahead, hope you all have had a good one so far! 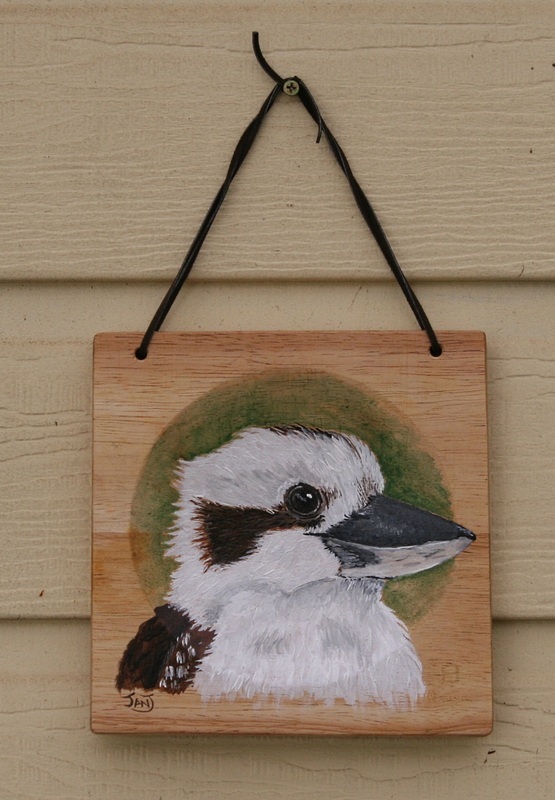 I have been busy doing smaller paintings on board for the markets which you can find on facebook. https://www.facebook.com/JansImpressions?ref=hl If you go to my albums its in a Sale Album. I have sold some of them already which is great. I can't say enough about when doing portraits make sure your pencils are really sharp! Take your time with shading, build up your layers, and go dark where you need to. 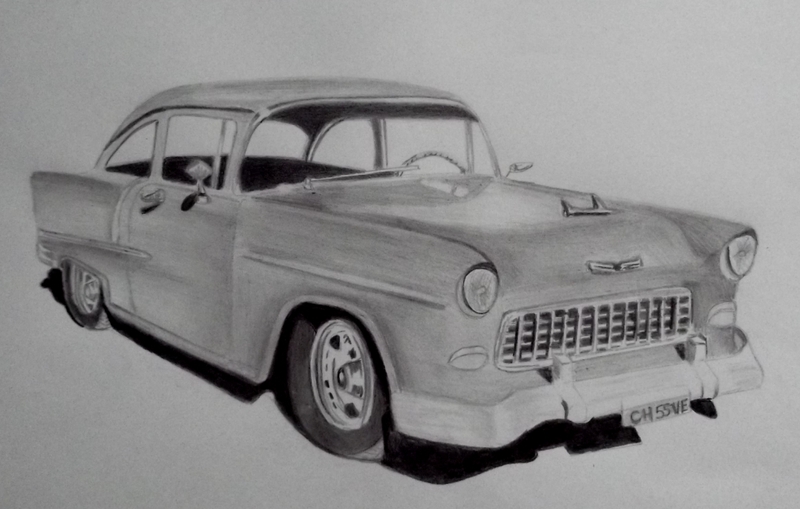 Don't be afraid to experiment with pencils, its the only way to see what results you get. 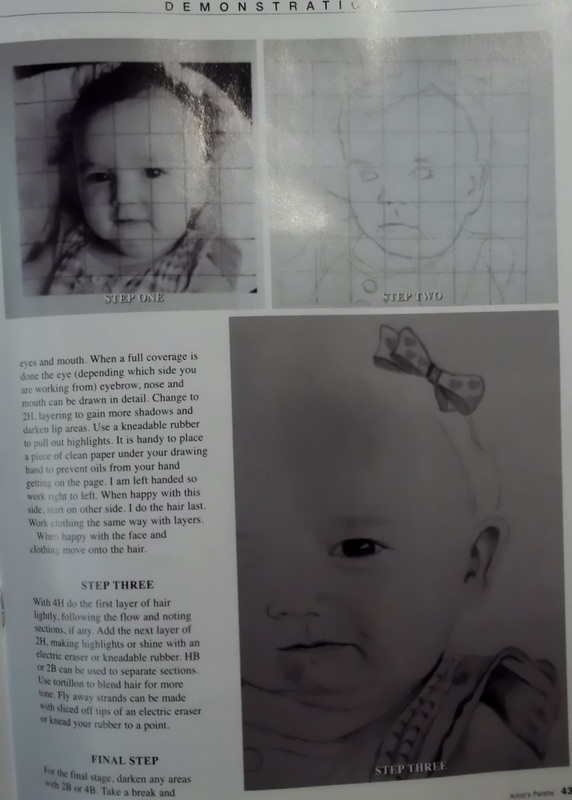 Try using different blending tools, I follow the 5PM Method which you can find here... http://www.fivepencilmethod.com/ There are so many free pages on there to copy from and get great tips! I also use felt pieces, different size tortillons (tightly packed and rolled paper with a pointy tip) and sometimes cotton tips. With my errors and I do make lots.... I use an electric eraser which is a can't do without tool, and a kneadable eraser. The electric eraser is great also for taking out highlights in eyes, hair etc. while the kneadable rubber is good for taking back darker spots to lighter and also can be moulded to a pointy tip for thin lines. I always like to ask my husband for checkups during and when finished my portraits, because he will more than likely spot something not quite right, which I appreciate, (but really inside I am saying damn, I wish I had spotted that) :) I think there probably has been maybe 2 out of my hundreds that he hasn't found any faults. The Shelly Beach Markets are coming up next weekend on Saturday 31st. from 9 - 2pm. So if you are on the Central Coast come and have a wander around. I am on Stall 17 Yellow Zone. Come and say hello and check my stuff out! So as the month is coming to an end soon, I have enjoyed my time with painting, drawing, doing a few massages, getting a couple of massages myself, having my gorgeous grandson sleeping over and playing games. Catching up with my girls, we are riding the Triumph to Newcastle on Wednesday night to have dinner with our youngest daughter Lauren, so looking forward to that. Being in a place with my husband who loves me for me is the best feeling. If its one thing that is consistent its the days and time going fast. Into the last weeks of July and I have the markets to get ready for next weekend. Had fun at the last ones, selling some cards, a portrait and doing several mini massages. Meeting lots of people was fun also. I have been drawing a few portraits lately to take to the markets and now am able to announce I can do laminated prints of them in all different sizes! I also have bought a portable massage chair so I will look pretty darn professional now!!! Bring it on I say, and hope I get lots of people with sore necks and backs for me to work on. (Not that I wish that on people really, sorry, but they will certainly benefit it from having a massage). Made up some bigger signs for my artwork with prices etc, getting more organized than the last one. You always improve I think as the months go by and make your stall more inviting. So if you are interested in coming to them, they are at The Entrance High School, 27th July, 9 - 2pm. Be there or you will miss out on lots. There are over 100 stalls now, all undercover with a kids play area too. I sold, to a lovely guy called Randel in Queensland, an A2 laminated print of my portrait of Clint Eastwood. It looked pretty cool that size and its going into his mancave when he gets it. Hopefully it will be Monday. This is a pic of the size he got. I am getting an A2 print of Bob Marley to have as an example at the markets. 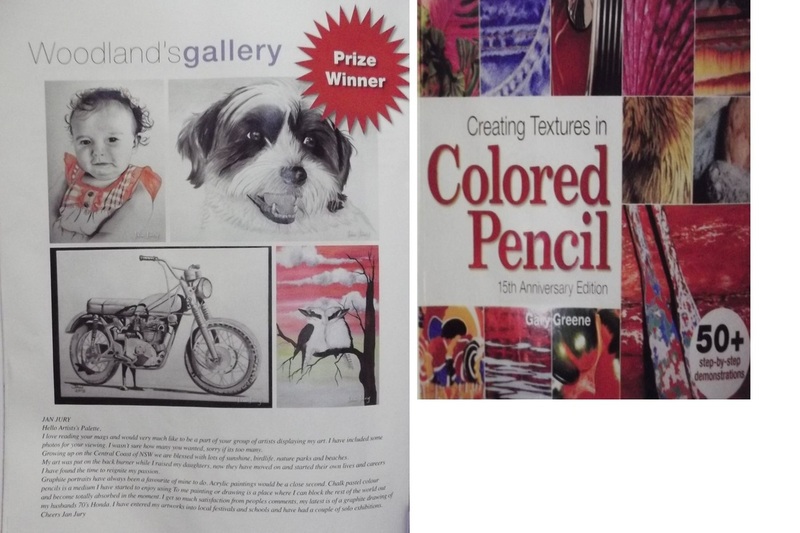 An art magazine called Artists Palette had some of my art published in their mag and I was the prize winner also!! Pretty stoked about that. This is the page and the other side is my prize. 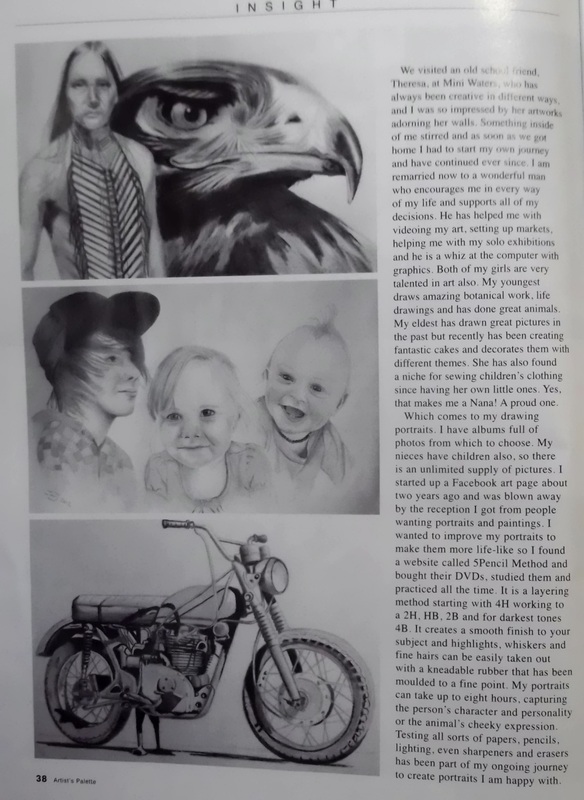 Also in August I think, they are doing a 4 page spread of my artworks, a write up of me and how I got into art and a step by step process of how I do a portrait, and some tips and hints. Can't wait till it comes out, I might buy 10 copies haha!! 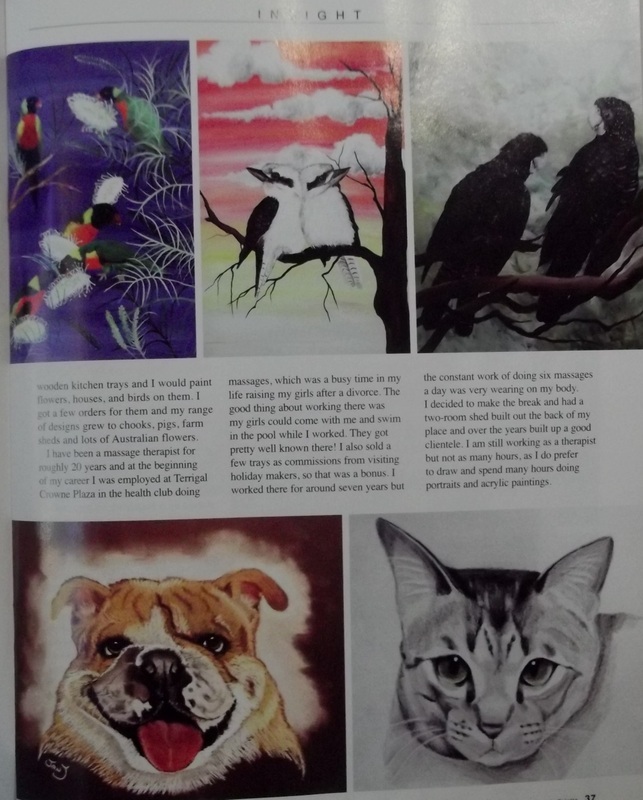 In September the Central Coast Gramma School have their annual fete and art exhibition and I will exhibiting 5 of my paintings. I have decided to put in my kookaburras, galahs, falcon, black cockatoos and white cockatoos. Looking forward to seeing them amongst all the artworks. They usually have around 500 pieces on display and for sale. Be a bonus if I sell one, or two, or three..... just hoping, you gotta hey? In November, I know I am jumping the gun a bit here, but it will be around soon enough. The set of shops at Woy Woy called Gnostic Forest has a cafe and I will be showing off 15 of my paintings for the month. 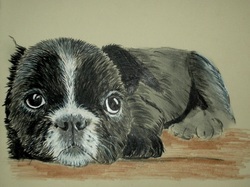 I might put in some portraits amongst the paintings, but that is a while away so will sort it out nearer the time. Very excited about that too. So there are several things in the pipeline for me, its all about me getting my art out there to the public. Well its Friday afternoon, time to sip on a glass of wine, and put my feet up, (thats after walking the dogs, and making dinner). Enjoy your weekend coming, where ever you are and be creative in whatever do and makes you happy.